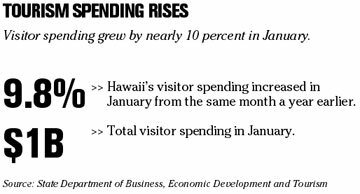 Cruise passenger traffic through Honolulu grew dramatically in 2005, showing a 37.9 percent increase from the previous year, versus a 3.5 percent increase for all North American ports, according to preliminary figures from the U.S. Maritime Administration. The agency's figures, which cover the 17 largest cruise lines that visit North American ports, show 235,600 passengers departed Honolulu during the year, compared with 170,900 the year before. Of the 87 high-traffic ports tracked by the agency, only Los Angeles had a larger percentage increase, 41.5 percent, with more than 614,000 passengers. San Diego was behind Honolulu with a 35.7 percent increase. Honolulu was 12th among U.S. ports in total passenger departures. Miami was first, with 1.7 million. The state government continues to take in money hand over fist. The state took in $346 million in taxes in February, pushing the tax take for the first eight months of the current fiscal year to $2.8 billion, an 11.3 percent increase over the same eight-month period of the previous fiscal year, the Department of Taxation said yesterday. On Monday, the state Council on Revenues predicted the state's annual tax take would climb 9.5 percent by June 30, the end of fiscal year 2006. United Airlines said yesterday it is adding two Honolulu flights for the summer season as part of 15 new routes it will be offering. The carrier, which exited from bankruptcy on Feb. 1 after more than three years in bankruptcy, will expand service from Hawaii with weekend flights to San Diego and Seattle beginning on June 10. Hawaiian Airlines' air traffic rose 6.9 percent last month compared with a year earlier as 459,980 passengers boarded flights. The airline's total miles flown by paying passengers rose 9.9 percent last month to 514.4 million. Its seats were 87.7 percent full in February, a gain of 4 percentage points from February 2005. United Airlines parent UAL Corp., which last month exited the eighth-largest U.S. bankruptcy, will pay more than $335 million to lawyers and consultants for work on its reorganization. The company has paid $335 million in fees and expenses and is almost finished with those payments, according to a final request for compensation filed yesterday by Kirkland & Ellis, its bankruptcy law firm. The Chicago-based firm said its total charges are $99.8 million, of which it has received $91 million. Google Inc., the most-used Internet search engine, said it agreed to pay $90 million to settle a "click-fraud" lawsuit with companies claiming they paid for ads that had no chance of generating sales. Under the settlement, which requires a judge's approval, advertisers that believe they have been the victim of click fraud at any point in the past could apply for advertising credits. Click-fraud occurs when companies, not potential customers, click on rivals' ads on Google to drive up their marketing costs. Click-fraud also occurs when Web site owners who display other companies' ads use automated software to click on the ads to line their own pockets. Apple Computer Inc. has began selling multiple episodes of Comedy Central's "The Daily Show With Jon Stewart" and "The Colbert Report" for a monthly fee. The Multi-Pass service lets iTunes customers buy 16 episodes for $9.99 a month, Viacom Inc.'s Comedy Central cable television network said. Apple plans to sell more programs through Multi-Pass in the future, said Eddy Cue, vice president of iTunes. Apple's iTunes online store started selling TV shows, music videos and short films in October after Chief Executive Steven Jobs introduced a version of the iPod music player that also plays videos. Apple said last month that it has sold more than 15 million videos from Pixar, Walt Disney Co. and others at $1.99 each. SANTA BARBARA, Calif. » Federal fishery regulators have imposed a permanent ban on trawl fishing in nearly 150,000 square miles of federal waters off the West Coast. In making the decision, the National Oceanic and Atmospheric Administration rejected a proposal crafted by environmentalists and the fishing industry that would have covered twice as much area.